ZIMBABWE – The crack team set up to investigate the break-in at Acting President Emmerson Mnangagwa’s offices on Tuesday last week is now analysing the evidence being gathered, while investigations continue. The break-in, the fourth at the Acting President’s office at the Ministry of Justice, Legal and Parliamentary Affairs, has baffled many. The crack team comprises members from the police, military forces and Central Intelligence Organisation is conducting a scientific analysis to establish the identity of the perpetrators and their motive. Police chief spokesperson Senior Assistant Commissioner Charity Charamba yesterday confirmed that evidence gathered was being analysed. “Investigations are still in progress,” she said. “The investigations are a process which involves gathering evidence and analysing it. As of now, we will not divulge much information as we will compromise investigations. Last week, Snr Asst Comm Charamba said they were doing everything possible to establish the identity of the perpetrators and their motive. She said from the part of the police, a team of experts was working on the case together with officials from other security departments. Intruders have broken into Acting President Mnangagwa’s offices six times — four times at the Ministry of Justice, Legal and Parliamentary Affairs, once at Defence House when he was Minister of Defence, and at his Zanu-PF Headquarters office in 2014, during the party’s Congress where President Mugabe appointed him Second Secretary of the Party and Vice President of Zimbabwe. In the Zanu-PF headquarters incident, the intruders laced his desk with cyanide, which affected his secretary when who had to be hospitalised for several days. 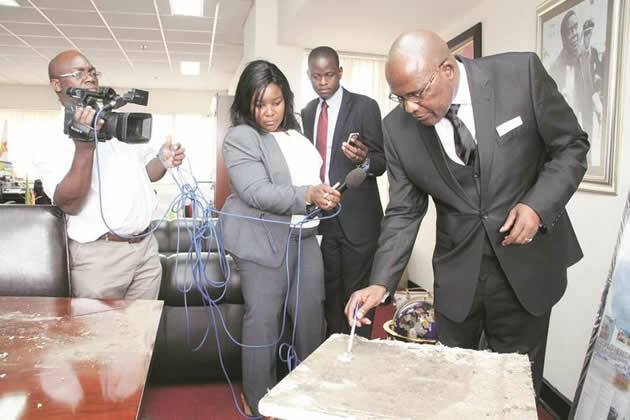 On the latest incident at the Ministry of Justice, Legal and Parliamentary Affairs, the intruders drilled a ceiling panel to gain access into Acting President Mnangagwa’s office. It was not yet clear how they reached the ceiling since there are no traces of how they got there and that the complex is guarded 24 hours. Home Affairs Minister Dr Ignatius Chombo last week said law enforcement agents must do all they can to arrest criminals who broke into the office.